Reading and share top 32 famous quotes and sayings about Instructive by famous authors and people. Browse top 32 famous quotes and sayings about Instructive by most favorite authors. 1. "One who utters speech that isn't rough But instructive and truthfulSo that he offends no one, Him I call Brahmin." 2. "Perhaps if zoologists would contemplate the wide variations presented by many plants of indubitably one and the same species, and the still wider diversities of long cultivated races from an original stock, they would find more than one instructive parallel to the case of the longest domesticated of all species, man." 3. "When I was CEO, and I'd listen to music, a lot of people listen to music and you get inspiration from it. And a lot of things in hip hop are very instructive for being in business. Particularly, hip hop is a lot about business, and so it was very useful for me in any job." 4. "Through the discovery of Buchner, Biology was relieved of another fragment of mysticism. The splitting up of sugar into CO2 and alcohol is no more the effect of a 'vital principle' than the splitting up of cane sugar by invertase. The history of this problem is instructive, as it warns us against considering problems as beyond our reach because they have not yet found their solution." 5. 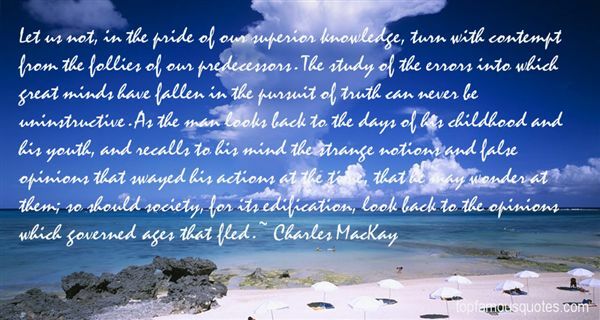 "Let us not, in the pride of our superior knowledge, turn with contempt from the follies of our predecessors. The study of the errors into which great minds have fallen in the pursuit of truth can never be uninstructive. As the man looks back to the days of his childhood and his youth, and recalls to his mind the strange notions and false opinions that swayed his actions at the time, that he may wonder at them; so should society, for its edification, look back to the opinions which governed ages that fled." 6. "I'm used to people with very high IQs knowing how to recognize reality, but there's a huge human tendency where it may be instructive to think that whatever you're doing to succeed is all right." 7. "Growing up, in church we had the homily; at home it's what I call the 'momily' - the inspirational and instructive mom-isms that every family has." 8. "It may be in the cultural particularities of people — in their oddities — that some of the most instructive revelations of what it is to be generically human are to be found." 9. "To read the report of a discussion in which arguments for and against are presented, in which a subject has been covered from different points of view, with new ideas advanced - this is far more instructive than to read a brief account of the resolution passed on the matter." 10. "Even fairly good students, when they have obtained the solution of the problem and written down neatly the argument, shut their books and look for something else. Doing so, they miss an important and instructive phase of the work. ... A good teacher should understand and impress on his students the view that no problem whatever is completely exhausted." 11. "The story of terrorism is written by the state and it is therefore highly instructive… compared with terrorism, everything else must be acceptable, or in any case more rational and democratic." 12. "No fossil is buried with its birth certificate. That, and the scarcity of fossils, means that it is effectively impossible to link fossils into chains of cause and effect in any valid way... To take a line of fossils and claim that they represent a lineage is not a scientific hypothesis that can be tested, but an assertion that carries the same validity as a bedtime story—amusing, perhaps even instructive, but not scientific." 13. "Sweet or bitter, I am now convinced that all experience is enriching and rewarding. Above all, instructive." 14. "Failure is instructive. The person who really thinks learns quite as much from his failures as from his successes." 15. "I think paranoia can be instructive in the right doses. Paranoia is a skill." 16. "No soul or locale is too humble to be the site of entertaining and instructive fiction. Indeed, all other things being equal, the rich and glamorous are less fertile ground than the poor and plain, and the dusty corners of the world more interesting than its glittering, already sufficiently publicized centers." 17. "They were lovebirds. They entertained each other endlessly with little gifts: sights worth seeing out the plane window, amusing or instructive bits from things they read, random recollections of times gone by. They were, I think, a flawless example of what Bokonon calls a duprass, which is a karass composed of only two persons." 18. "The story goes like this," he said. "We were having dinner together, you and I. As we do from time to time. It was grimgrouse. Over-spiced. You killed the cook for that. Temper." He added, as an instructive side, "You know, in a story, it's the details like that that make it seem real. Anyway, you for a bone stuck in your mustache. Did I mention you has a mustache?" 19. "It was almost two years after I left Capital that I put out the first one on Chrysalis and that was really instructive because it was no better in particular than any other record I'd done." 20. "It would be an instructive exercise for the skeptical reader to try to frame a definition of taxation which does not also include theft. 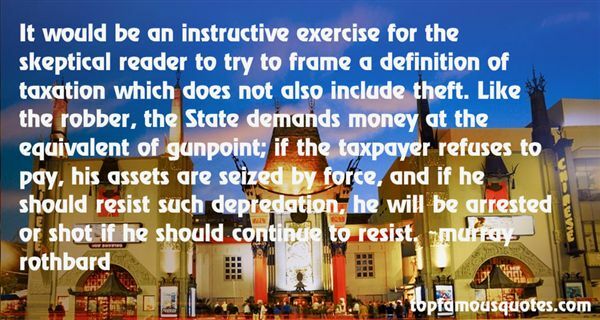 Like the robber, the State demands money at the equivalent of gunpoint; if the taxpayer refuses to pay, his assets are seized by force, and if he should resist such depredation, he will be arrested or shot if he should continue to resist." 21. "Walking and overcoming by faith is not easy. For one thing, the dimension of time constantly constrains our perspective. Likewise, the world steadily tempts us. No wonder we are given instructive words from Jesus about the narrowness and the straightness of the only path available to return home: "I am the way, the truth, and the life" (John 14:6). And then he said, "No man cometh unto the Father, but by me." Jesus laid down strict conditions." 22. "Children also have artistic ability, and there is wisdom in there having it! The more helpless they are, the more instructive are the examples they furnish us; and they must be preserved free of corruption from an early age." 23. "It's always instructive to observe the life cycle of the First World aid worker. A wary enthusiasm blooms into an almost messianic sense of what might be possible. Then, as they bump up against the local cultural limits of acceptable change, comes the inevitable disappointment, which can harden into cynicism and even racism, until they are no better than the resident whites they have initially disparaged." 24. "And where are the other gentry that were taken?—the real leaders of this plaguey rebellion. Grey's case explains their absence, I think. They are wealthy men that can ransom themselves. Here awaiting the gallows are none but the unfortunates who followed; those who had the honor to lead them go free. It's a curious and instructive reversal of the usual way of things. Faith, it's an uncertain world entirely!" 25. 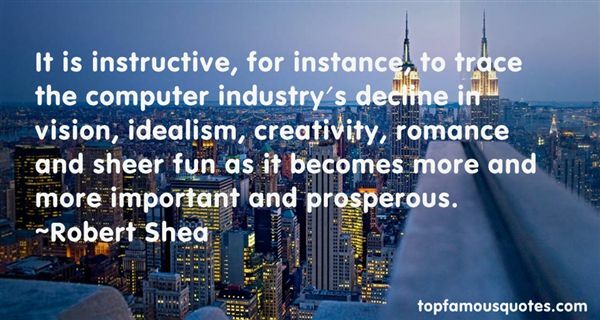 "It is instructive, for instance, to trace the computer industry's decline in vision, idealism, creativity, romance and sheer fun as it becomes more and more important and prosperous." 26. "The great book for you is the book that has the most to say to you at the moment when you are reading. I do not mean the book that is most instructive, but the book that feeds your spirit. And that depends on your age, your experience, your psychological and spiritual need." 27. "It is difficult at times to repress the thought that history is about as instructive as an abattoir; that Tacitus was right and that peace is merely the desolation left behind after the decisive operations of merciless power." 28. "Back when George W. Bush was identifying his Axis of Evil, it struck me that a longer and more instructive list could be compiled of the Axis of the Humiliated (or Insulted and Injured, to borrow from Dostoevsky)." 29. "The writing of solid, instructive stuff fortified by facts and figures is easy enough. There is no trouble in writing a scientific treatise on the folk-lore of Central China, or a statistical enquiry into the declining population of Prince Edward Island. But to write something out of one's own mind, worth reading for its own sake, is an arduous contrivance only to be achieved in fortunate moments, few and far in between. Personally, I would sooner have written Alice in Wonderland than the whole Encyclopedia Britannica." 30. "Tale is thus both instructive and cautionary, filled with lessons about innovation, character, leadership, and values. Shakespeare's Henry V—the story of a willful and immature prince who becomes a passionate but sensitive, callous but sentimental, inspiring but flawed king—begins with the exhortation "O for a Muse of fire, that would ascend / The brightest heaven of invention." For Steve Jobs, the ascent to the brightest heaven of invention begins with a tale of two sets of parents, and of"
31. "All situations in which the interrelationships between extremes are involved are the most interesting and instructive." 32. "There's a great power of imagination about these little creatures, and a creative fancy and belief that is very curious to watch . . . I am sure that horrid matter-of-fact child-rearers . . . do away with the child's most beautiful privilege. I am determined that Anny shall have a very extensive and instructive store of learning in Tom Thumbs, Jack-the-Giant-Killers, etc." My songs are self-explanatory... somebody pointed out to me that... my songs pretty much speak for themselves."